Am I blue? Am I blue? Ain’t these tears in my eyes telling you? All right, I got that from an episode of Justice League – that’s right, my superhero obsession goes far beyond The Avengers, and truthfully far beyond Marvel. Here’s the YouTube of Batman singing. I still laugh every time, proving that I am not the most mature of the 24-year-olds. Anyway, yesterday my mom and I went out for an absolutely lovely Mother’s Day brunch, and we followed the day up with shopping for…new corporate clothes! That’s right, I’m moving a step up from business casual and starting a new job at a very large company in my area. I put in my two weeks’ notice today, which has fueled my anxiety to no end. I’m leaving my first “big girl” job out of college, and while going to a new company is a great step in my career, it’s also an end of a saga in my life that I enjoyed to no end – I met The Boyfriend at this company, I networked and learned from amazing people, and I met great friends who I hope to keep in my life even if I can’t see them every day anymore. The blue, then, is twofold. I’m a little bummed to be leaving my job, so I could say I’ve got the blues. 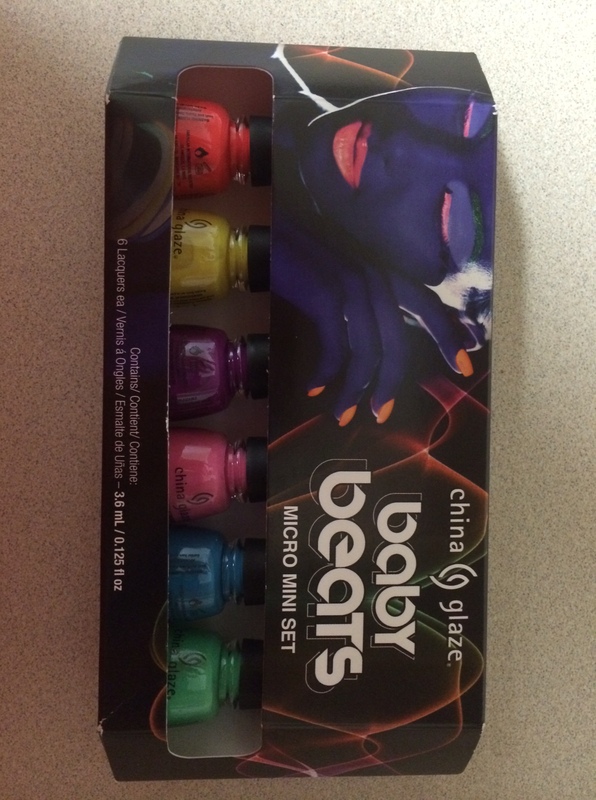 However, more importantly, on my shopping trip I acquired the Baby Beats set of mini bottles from China Glaze’s Electric Nights collection, which are some of the most gorgeous summer neons I’ve had the privilege of owning. Seriously, every single one of them makes me think of dancing the night away to some techno music under blacklights, or eating a snow cone on a boardwalk just as the sun begins to set. Basically, picture a hot summer evening full of color and energy, and you’ve got this collection. And then I ruin it with the horrible photo. 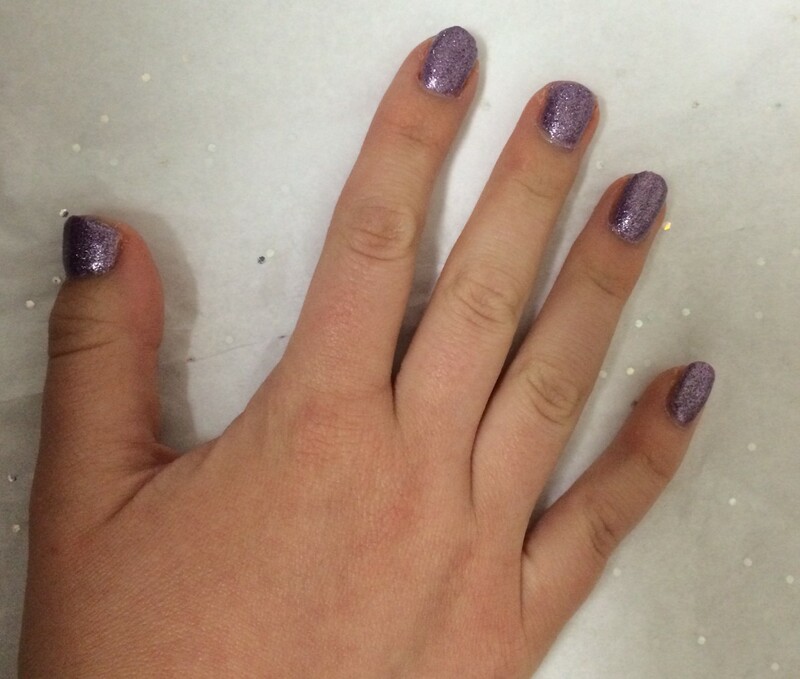 At the register at Charming Charlie’s (not where I got the collection – that was at Ulta – but I knew at the time I would be painting my nails that night), I asked an employee to pick a color, any color. Between all the craziness in my nail polish collection, I could have worked with anything. But she said blue! I think it was a sign – blue was exactly the color I was feeling. I started with DJ Blue My Mind, one of the Electric Nights polishes in my new mini collection. 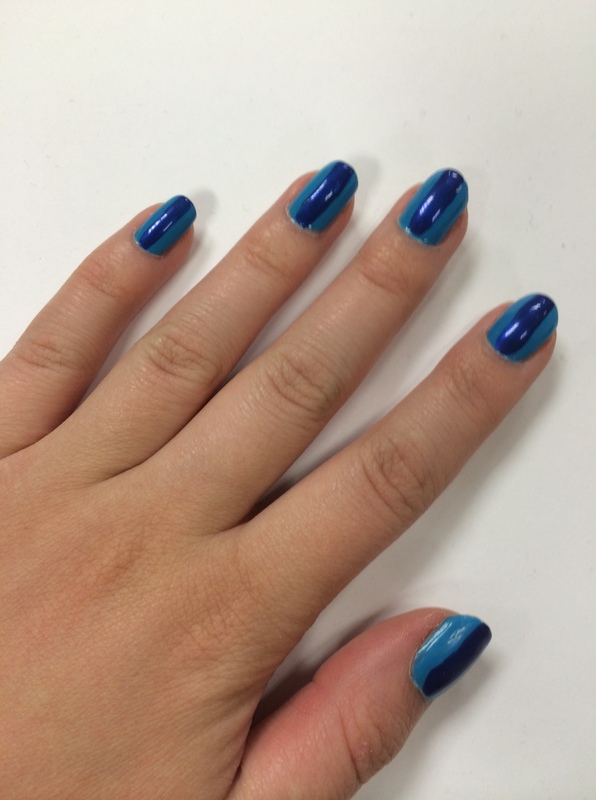 It’s GORGEOUS, and I’ll definitely be featuring it in some upcoming summer nail art – it’s just such a cool, pure blue that makes me think of skies and seas. But then…I was struck by some inspiration. Why paint one blue when you can paint two blues (and sound like Dr. Seuss!)? I scoured my collection for one of my favorite Essies, Aruba Blue. While DJ Blue My Mind reminds me of skies and seas in the daytime, Aruba Blue reminds me of the two at night – the vibe together is fun, funky, and perfect for a party feeling to take away some of the stress I’m under with the job switch. I used a technique I saw in a magazine sometime in high school, before my nail obsession began, and painted a dark blue stripe down the middle of each nail. Since I probably won’t be allowed to have such crazy colors on my nails at my new job (don’t worry; posts about spicing up neutral nails are already being drafted! ), I’m taking advantage of being fun and funky while I still can. I’ll worry about maturity in a couple of weeks; for now, I’ve got the blues and I couldn’t be more proud of them. I believe whatever doesn’t kill you simply makes your nails…stranger. I’m sure I’ll talk about why it’s been a rough week later (Eek, major changes in the life of a twentysomething? Call the authorities! ), but if there’s anything I like to do when life’s been a little crazy, it’s slow down, take a few deep breaths, maybe do a little meditation or go for a nice long run, AND THEN PAINT MY NAILS THE CRAZIEST COLORS I CAN POSSIBLY FIND. I feel a little bit like screaming right now, but since my apartment has very thin walls and the neighbors probably wouldn’t appreciate the high-pitched shriek of a Soprano I (who totally nailed the high B at her last Christmas concert, but I digress), I’m going to let my nails do the screaming for me. Usually, to me, this means neon, but I’m feeling contradictory. There’s only one possible solution: GLITTER. I couldn’t choose between my two favorite solid glitter polishes for this week, and because I get reckless when I’m upset, I decided that I didn’t have to pick one or the other. 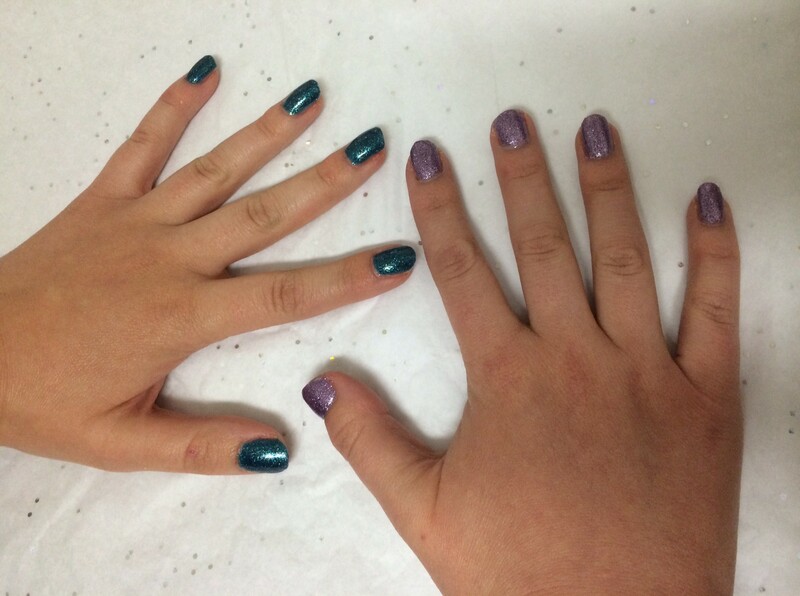 That means that I’ve done one hand in glitter teal and the other hand in glitter purple. Any resemblance to the Joker is intentional (and if you’re as into comics as I am, let’s talk about the Joker in comments! What do you think of Jared Leto??). Please ignore my middle nail – I broke it in a desk drawer and it hasn’t forgiven me. I didn’t intend to use yet another Julep for the blue-green hand. 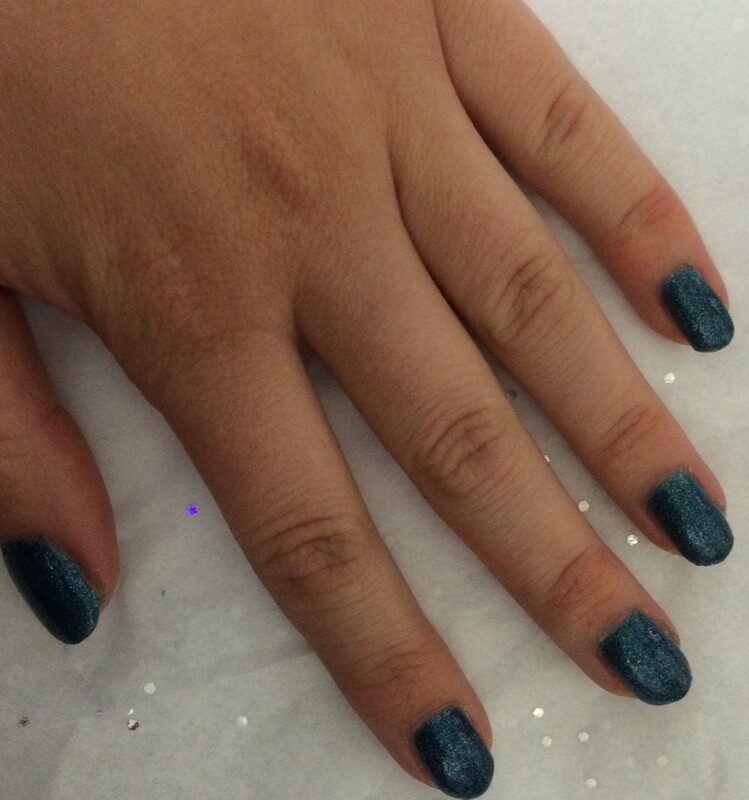 The blue-green I wanted is a Butter London in Henly Regatta that I picked up for $7 at a South Moon Under last summer when I was a little tipsy after a dinner with my friend. 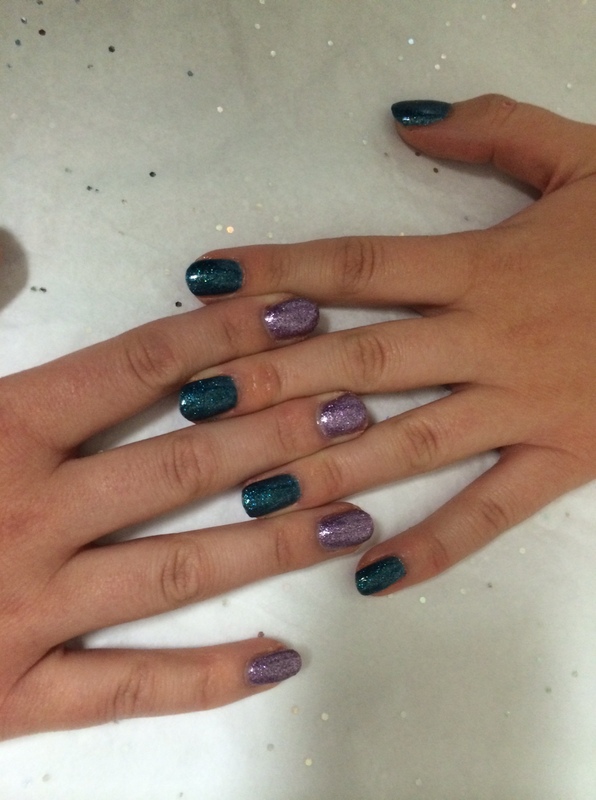 Thankfully, the nail polish was the only impulse buy she let me get while we were there – SMU is expensive! Unfortunately, it didn’t last long. I remember the first couple of coats going on so perfectly last summer, although it took three or four to get the full opaque effect, but this application was just awful. The polish was barely a liquid and wouldn’t go on smoothly no matter what I did. I had to switch to a similar Julep I had, Julep Jennine, which did the job nicely in only two coats. The purple, China Glaze’s Tail Me Something is, strangely enough, a gift from Rachel in Minneapolis. I have never met Rachel, but she was my Santa in the Redditgifts Makeup and Nail Polish Exchange last year (which was a blast, and which I highly recommend if you’re a Redditor), and sent me so many cool polishes and tools that I’m still thanking her about a year later despite not knowing her last name. Well, anyway, I’m off to a crazy weekend – it’s Mother’s Day Weekend, so I’m taking my mom out for some nice things and hoping she doesn’t comment on my mismatched hands. In my opinion, it’s the best form of therapy.